Hello, guys! 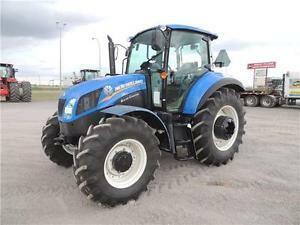 Here I m going to present the Classic Powerfull New Holland T5.115 Electro Command Tractor price, specifications, key features, implements, review, etc. 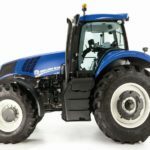 New Holland T5.115 EC Tractor extended with the appeal to dairy, livestock and mixed farmers with the addition of the Electro Command semi-powershift transmission. 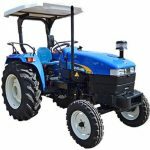 This agricultural machinery provides 114 horsepower. 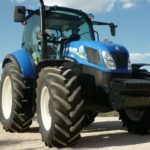 This tractor benefits from a state-of-the-art transmission alongside proven, class-leading, common rail technology for Tier 4 Interim compliance and the ergonomic VisionView cab. 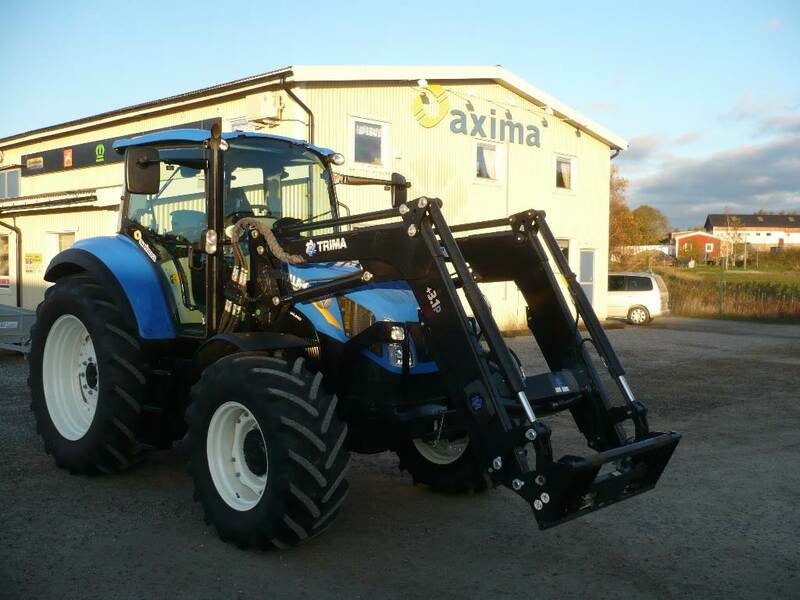 Furthermore, this tractor will be useful for municipalities and road maintenance operations thanks to an ideal range of working speeds and outstanding all-round visibility. 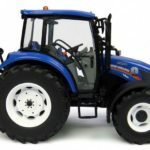 The New Holland T5.115 Electro Command model price is $74,895. The New Holland T5.115 Electro Command Tractor engine 114 Horsepower and that engine rated RPM is 2300. That F5D engine will give it to you with an excellent torque backup of 35%. This engine another feature such as 4 cylinder diesel engine, 207 cubic Inch (3.4L), power take off 98 horsepower. The Tier 4A emissions standards, F5D engines are equipped with a Cooled Exhaust Gas Recirculation system and a Diesel Particulate Filter. Rest assured, and Fiat Power Train has ample experience with CEGR and DPF on passenger cars and commercial light-duty trucks. 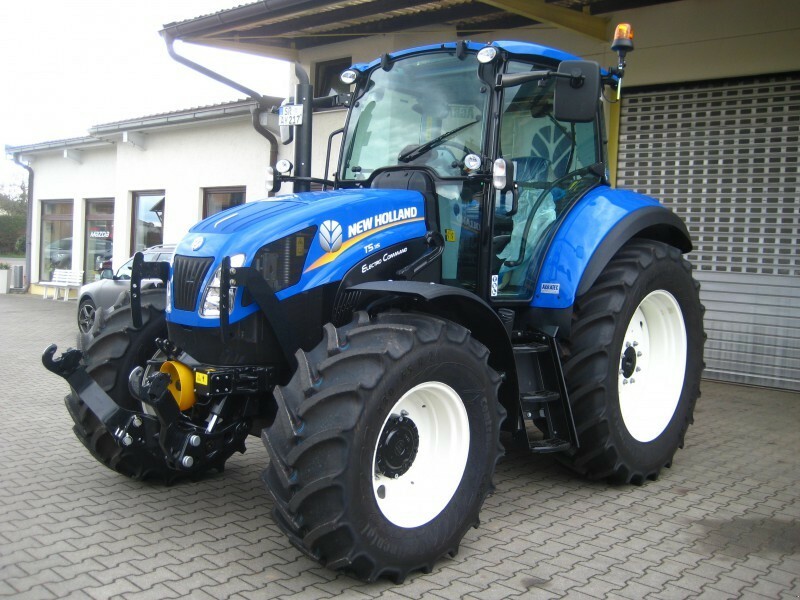 The New Holland T5.115 Electro Command Tractor transmission system is more powerful and reliable. It has a 16 x 16 Electro Command semi-powershift transmission. So in this Tractor no need to shift gear and moving multiple lavers because it has electro command transmission. This offers you with a total of 16 forward and reverse gears, or 32X32 with the optional creeper. With Electro Command, one shift lever is all you need, and moving your thumb is all that’s required. On the side of the Electro Command lever are two buttons used to shift up and down through each of the 4 gears in each range. Use the side buttons in conjunction with the button on the back of the lever to shift between ranges B and C.
The New Holland T5.115 Electro Command tractor will benefit from a heavy-duty braking system. Brake disc life has been further extended to enhance the already impressive stopping performance. The New Holland T5.115 Electrocommand Tractor column-mounted electrohydraulic Powershuttle can be easily operated without taking your hand off the steering wheel, helping to increase your safety during loader work. You can easily regulate the aggressiveness setting, even while moving, with an ergonomically positioned switch on the B-pillar. The New Holland T5.115 Electro Command Tractor Hydraulic system is powerful and reliable. That lifting capacity is 6,393 lbs(2900 kg). You can increase lifting capacity using one additional 50mm auxiliary lift ram can be installed to increase lift capacity to 8,809 lbs. (3,996 kg.) or two additional rams can be installed for an impressive lift capacity of 10,452 lbs. (4,741 kg.). The main implement pump on The New Holland T5.115 Electro Command tractor has a flow of 21.1 gallons per minute 80 liters per minute, and the steering pump has a flow of 43 l/min. Together these two offer an effective 32.5gpm of flow. To control the three-point hitch, an ergonomic mouse is located within easy reach of the driver’s right hand. This mouse is an acclaimed New Holland design for one-handed operation. For instance, a suitable fast link lower button makes returning an implement back to work even simpler, helping to speed up your productivity. 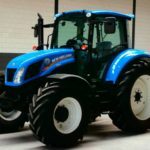 The New Holland t5.115 Electro command Tractor Fuel Tank capacity is 140 liters, and that is well suited for the long work no need to refuel during the farming operations. 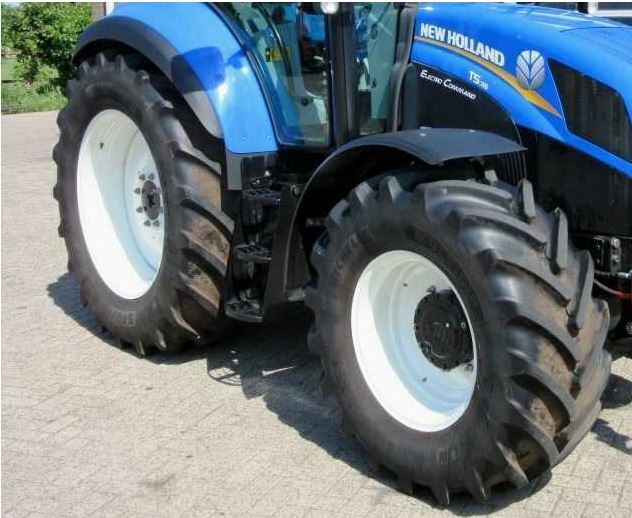 The New Holland T5.115 Electro Command Tractor Front tire size is 14.9 R24 R1WA8 and that rear tire size is 18.4 R34A8. This tire is strong and well suited for the long durations. That is less slippage on the field because it provides better grip and traction. The New Holland T5.115 EC Tractor has a Vision View CAB. You will be impressed when you look up and have a perfect view of your loader thanks to the optional high visibility panel. The new high-performance air conditioning system features dual zone technology to ensure high performance during the hottest summers and the coldest winters. The most frequently used controls are all easily located on the CommandAr console to your right. 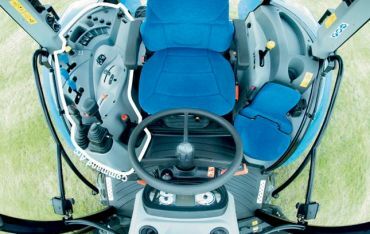 This ergonomic cluster puts your PTO, hydraulic levers, throttle, three-point hitch controls, and even your loader joystick all in one suitable location.That comfortable seat provides relaxes and reduce the operator fatigue during the farming operations. The T5.115 Electro Command tractor is designed with loader in mind, with up to 84 liters/minute of dedicated flow and a dedicated 43 liters/minute services pump. The fully-integrated electronic joystick falls perfectly to hand and requires only the lightest brush of the hand for precision loader operation. Super-fast cycle times mean you can stack bales in the blink of an eye. The low mounting points guarantee a super stable operation. 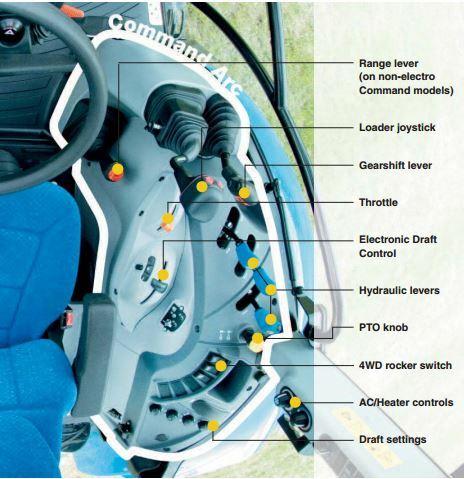 This article is all about the New Holland T5.115 Electro Command tractor detail info. 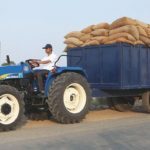 You can blindly trust it because it is genuine and reliable information, that is very helpful to you for buy this tractor, but if you have any query regarding this article, then please comment below in the comment box, thanks.